I have problems getting the analog AV output of an OpenELEC Box to work as expected. I have the original "long TRRS" WETEK cable connected to a CRT tv. When I power on the box, I can see a nice WETEK splash screen for a couple of seconds, everthing's fine so far. But after the splash screen, it seems that the box switches to a different mode and all I can see are bright lines rushing over a black screen. I can hear audio though and I can see that the pattern of the rushing lines changes with the tv program. So, please: How can I get the analog AV output to deliver a normal color tv picture? How can I change the resolution in KODI, i.e. force KODI to use the right resolution? Under System -> Settings -> Video output the point "Resolution" is just greyed out and not changeable. At the moment it's not possible to use the analogue A/V output on OpenELEC. Most probably a patch in KODI might get the proper video output but at this point it's not possible nor supported. Oh! Is it a KODI issue or an OpenELEC issue? It would be a pity if the next release of OpenELEC would not solve the problem, just because noone opened a bug ticket in the appropiate bug tracker. Can you provide a test build, so they don't have to install OE 5.0.6? Ok, no test build from codesnake up to now. I was able to build an OpenELEC 6.0.0 version with CVBS analog AV support which works ok except for the second splash screen. So with this build, it IS possible to use the analog AV output during normal operation. For all the others out there who would like to use this feature: I'm willing to upload the update image, if someone could provide some webspace for it. I really hope that this patch will find it's way into the next OpenELEC major release, or even the next maintenance release. For all you out there who are also missing analog AV output: Go to Github, there is a bug tracker, join the discussion!!! 3) reboot your box. This will update the OpenELEC image, so give it time and don't interrupt the process! 4) Now, the box should go to 576cvbs mode when there is no HDMI monitor connected. Of course, you can't use the HDMI and the CVBS output at the same time. Disclaimer: WARNING: This is experimental and unsupported. Use at your own risk. If you brick your box, your house burns down, your wife leaves you, well, I warned you. Thanks a lot, it worked for me BUT, image quality is poor. I have an old emtec Q800 box with the firmware http://www.mhdworld.de/fr/featurelist.html. AV anolog output has better image quality, but no TNT HD. OR the wetek tuner is not optimized. Two boxes are connected alternatively with the same antenna. Should I buy an HDMI to analog output and/or buy an antenna amplifier? For me, I was amazed of the good quality of the CVBS output of the WeTek box. It's definitely much better than the CVBS output of a Raspberry Pi. I used it with two old CRT TV sets up to now, and both showed a much better picture quality than when watching analog TV with the internal tuner. I was really, REALLY surprised how good the picture of a CRT screen could look like. Before all that stuff was working, I was also using different HDMI-to-CVBS converters (for example Liwago, best quality in my experience). Not only for the WeTek box, but also for the Raspberry Pis. I can tell you: For the WeTek box, the difference of picture quality is not worth the hassle of buying a (quite expensive) converter, having an addition box with a lot of cables lying around, ... The CVBS output of the box is really fine! For the Raspberry Pi in contrast, I would buy a converter. Also, I have not experienced any slow down just because I switched to CVBS. What kind of transmission standard do you use? DVB-C, DVB-T or DVB-S? I only use DVB-C.
For that I use tvheadend, not that VDR thing. I had constantly problems with VDR, so I switched to tvheadend and everything works quite smooth. In the webinterface of tvheadend, you can have a look at the BER, signal quality and all these things. If you have a bad signal, you should see it there immediately. If the error correction is heavily working, this could explain your box slow down. Where are you from? France? In France, they have SECAM, not PAL, right? If so: Sorry, I'm living in the PAL world. I have no way to test SECAM and haven't stumbled over anything in the code hinting on SECAM support. On the other hand: Beside PAL, my image should in theory also support NTSC, but that is untested, too. Since WeTek is still doing false advertising and not bothering about a non-funtional AV output at all, the community still has to take care about this on its own. Do you know if it works with Wetek Core too?? Sorry if question is absurd, i don't know how to begin to get AV out for CVBS. This is a build for Wetek Play, it won't work on the core as its a different build from the Core. Thanks a lot, any question solved. Do you now if openelec 6.0.3 is avalable for Core, in this case, is it working with AV out. Now i cannot use Core becouse AV out don't work, or i don't know how habilitate it. No, 6.0.3 is only available for the wetek play. Openelec 6.95.1[BETA] is the official release for the Core. Wetek Openelec Box? In Wetek shop i only see Core or play? Which hard do you have? And if you have core, how must i operate to change to Openelec? I've bought a micro SDHC 32GB card. i've have Core and TRRS jack cable to cvbs from wetek internet shoop. Android of core don't activate AV out, is it correct? I only see black screen on TV with AV out. If it is your case i'll try to fit your instruccions and i'll migrate to OPENELEC. WAITTING fou new notices from you, thanks. there is any enigma image that supports av? I'm afraid none of the existing enigma2 images supports A/V. I'm sorry about be saying " AV out of Core does not work "
It was because i used incorrect AV cable. 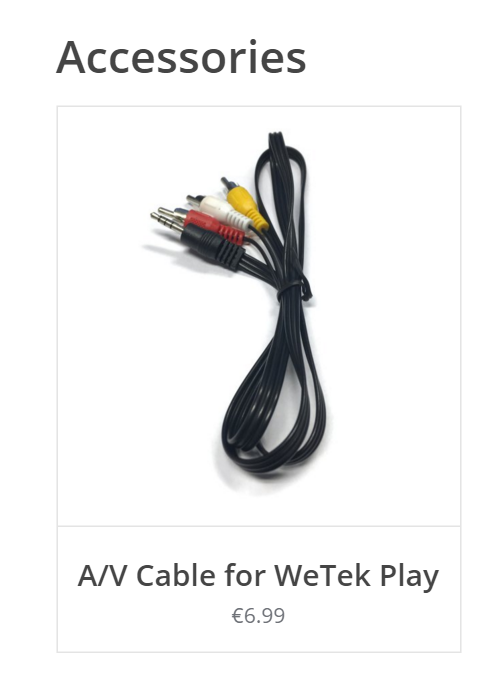 My sugestion is: Please indicate wich is apropiate cable for Wetek Core like you had done with WeTek Play. as you can see, there are a lot of similar cable with different configuration. I've currently got the problem that my Wetek.openelec box (wetek play special edition) does not output analog video. I connected it using my camcorder cable which has a pinout according to the camcorder configuration in the picture that Josep pasted in the post above mine. So I'm guessing that the pinout has to be as in the first configuration where ground is on the first pin since changing the leads doesn't give me any video either. Can anybody confirm this? Is your plug 17.5mm long? Otherwise it won't work. Even if the pinout would be correct. Hm.. the whole metal part is 16 mm. You need the infamous "long TRRS" cable. Normal TRRS won't work. And even if you have this, the official software does not support analogue output. You need the unofficial community firmware which is linked earlier in this thread.